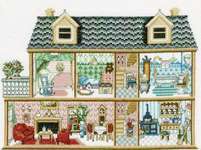 A pretty doll house filled with lots of tiny items as in all the best collector's houses - a grand piano and a cat in the boudoir, a wall bowl and jug in the bedroom, an umbrella stand in the hall. The kit has large scale black and white charts printed 10 stitches to three centimetres on four A3 sheets with separate key. 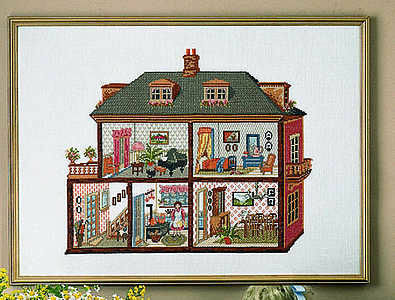 The pattern is worked in whole cross stitch two over two and backstitch in one strand using 31 shades of stranded cottons over 210 by 170.
the charts, needle and instructions.